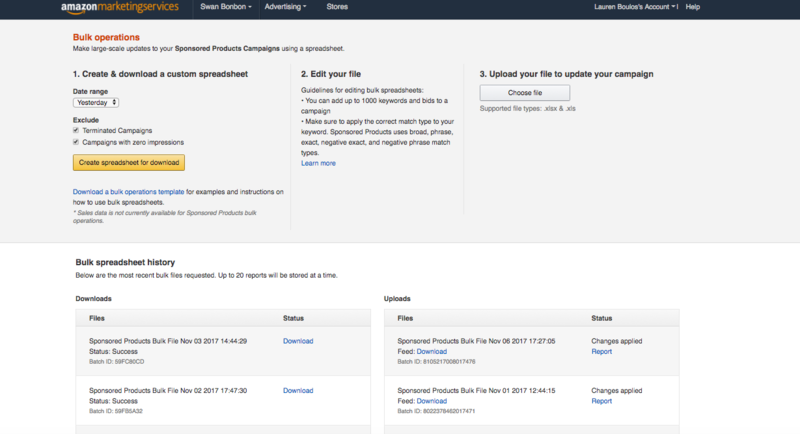 Driven to make campaign management easier and more efficient, Amazon Marketing Services, our search advertising solution for brands on Amazon, has introduced bulk operations for Sponsored Products. This highly-anticipated release empowers busy vendors to create, manage, and optimize their campaigns in bulk and at scale, saving time and manual effort. Advertisers – particularly agencies – both want and need the ability to implement large-scale updates to their campaigns quickly, without guesswork. The reason is simple: most agencies manage a large volume of campaigns, spanning multiple clients with varying needs and performance objectives. A feature that enables them to edit campaigns in bulk, for every client in their roster, increases their efficiency and lets them allocate more time to scaling and strategy. Bulk operations, in essence, solves an important problem for time-strapped agencies and large advertisers. The new feature lets advertisers make edits across multiple campaigns within a single spreadsheet, as opposed to making changes one by one within the AMS dashboard. Implementing those edits is easy, too. Just upload the spreadsheet for processing, and all changes will take effect simultaneously. A clean, coherent, user-friendly interface helps guide advertisers through the bulk upload experience. Once they’ve activated bulk operations in their account, they start by choosing their date range then create and download a bulk spreadsheet. An advertiser then makes edits in their custom bulk file just as they would in their campaign dashboard. They can add new keywords or targeted products to existing campaigns, update bids or increase budgets, and create new campaigns quickly and seamlessly. A key advantage to bulk operations is that clients can modify their spreadsheets anytime, anywhere – no dashboard access required. Learn more about Sponsored Products.